Hanningfield’s Uni-Mill conical screen mill can be designed to be a completely closed system, through the incorporation of split butterfly valves, a closed loop vacuum transfer system, or glove box milling. Due to the high energy involved in particle size reduction, dust clouds are created during the milling process. To prevent operators and the environment from being exposed to dangerous airborne powders, especially given the increased strength of the ingredients, a fully contained milling process is required for the purposes of safety and cross contamination avoidance. Although conical screen mills typically produce less dust than alternative forms of milling, there is likely to still be some level of dust generation which needs to be managed responsibly. The integration of a split butterfly or High Containment Valve between the inlet and outlet of two process components creates a fully contained method of product transfer, with virtually zero exposure to either the operator or the process environment. This is extremely important when handling potentially hazardous material and/or material that cannot be exposed to the ambient air. Split butterfly valves provide the most effective high integrity method of contained transfer. 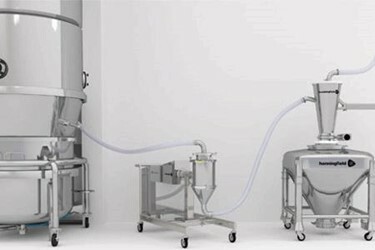 Another option for achieving a completely closed system is to pneumatic or vacuum transfer the product through the mill, which uses contained pipework and hoppers to transfer the material. Closed loop vacuum transfer not only contains the dust, but also automates the process and minimizes waste – helping customers make efficiency savings. Additionally, vacuum transfer through a mill reduces the operating temperature inside the milling chamber; a further benefit to improved processing. This process ensures that from pick-up to discharge the system is fully enclosed; preventing the escape of dust and subsequently protecting both the operator and the environment. An excellent solution for high containment milling is to use the mill inside a glove box / isolator. By creating a safe environment around the milling head, all excess material remains enclosed within the booth and ensures that the environment and operators are not exposed to any dust particles. Hanningfield offers a ‘through the wall’ design for the conical screen mill which enables the milling head to be contained within the glovebox, while the motor and controls are mounted externally. Moreover, the millhead can be removed from the rest of the body for cleaning simply by releasing a Tri-Clover.